So your toilet is leaking around the base and/or you constantly smell a bad odor in the bathroom. Chances are the wax ring on your toilet has failed and it needs to be replaced. The Changing a Toilet Wax Ring Ebook from HomeAdditionPlus.com provides simple to read, step-by-step instructions on how to replace the old Toilet Wax Ring with a new one. Pictures are included for each key step in the process! 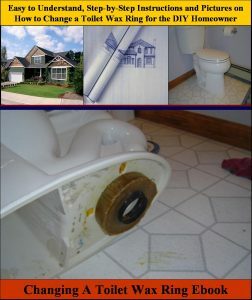 Order Now and Immediately Download the Changing a Toilet Wax Ring EBook today! The Changing a Toilet Wax Ring EBook costs only $15 and is 100% guaranteed.